Marshal Grant, Deputy Jensen, and Deputy Witbeck were shot and killed by a homicide suspect. At approximately 4:30 p.m., the three victims and a fourth deputy cornered the suspect at a farm near Saratoga Springs, having trailed him there from a murder scene near Highland Boy in Bingham Canyon. The suspect ambushed the officers with a lever-action .30-06 caliber rifle, instantly killing Marshal Grant, 39. Deputy Witbeck, 41, was shot through the abdomen and lived for 20 minutes. Deputy Jensen, 40, died shortly before medical aid arrived at the scene three hours later. The fourth officer survived the volley when he was thrown from his horse. The suspect fled the area and led responding officers on a two-day running gunfight back to Bingham Canyon, where he took refuge in the Utah Apex Mine. The mine was barricaded by hundreds of officers, who then cautiously searched the tunnels. A week later, the suspect shot and killed two officers inside the mine. The mine was sealed and pumped full of smoke. Reported sightings of the suspect caused the operation to continue for a month. When the mine was finally opened, the suspect had disappeared. Deputy Witbeck’s wife gave birth to the couple’s third child shortly after his death. He is buried in Salt Lake City Cemetery. His bronze name plaque is sponsored by the citizens of Salt Lake County. 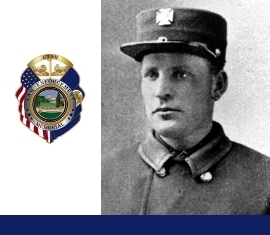 In 2003, historical research conducted by Salt Lake County Deputy Randy Lish indicated that after fleeing Utah the suspect was shot to death by Texas Rangers in 1921. Salt Lake County District Attorney David C. Yocum signed a memorandum formally closing the investigation into the murders. Amazing how many people are affected by ones actions. I am so proud to be a member of the Utah Peace Officer Association which started the Utah Law Enforcement Memorial (we are located in the same building now)and recognize, each year, 14 (different) fallen officers. If anyone has contact information on relatives I am the keeper of fallen officer relative information so we can reach out to family/relative members when these events occur. I can be reached at blsmith@sandy.Utah.gov.